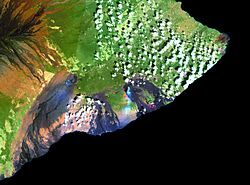 Kīlauea ( /ˌkiːlaʊˈeɪə/, US: /ˌkɪləˈweɪə/; Hawaiian: [kiːlɐwˈwɛjə]) is an active shield volcano in the Hawaiian Islands, and the most active of the five volcanoes that together form the island of Hawaiʻi. Located along the southern shore of the island, the volcano is between 210,000 and 280,000 years old and emerged above sea level about 100,000 years ago. The first well-documented eruption of Kīlauea occurred in 1823 (Western contact and written history began in 1778). Since then, the volcano has erupted repeatedly. Most historical eruptions occurred at the volcano's summit or its eastern rift zone, and were prolonged and effusive in character. The geological record shows, however, that violent explosive activity predating European contact was extremely common; in 1790 one such eruption killed more than 400 people, making it the deadliest volcanic eruption in what is now the United States. Should explosive activity start anew, the volcano would become much more of a danger to humans. 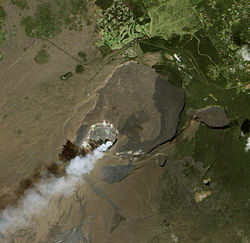 Kīlauea's current eruption dates back to January 3, 1983, and is by far its longest-duration historical period of activity, as well as one of the longest-duration eruptions in the world; as of January 2011, the eruption has produced 3.5 km3 (1 cu mi) of lava and resurfaced 123.2 km2 (48 sq mi) of land. 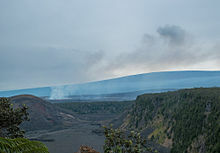 Kīlauea's high state of activity has a major impact on its mountainside ecology, where plant growth is often interrupted by fresh tephra and drifting volcanic sulfur dioxide, producing acid rains particularly in a barren area south of its southwestern rift zone known as the Kaʻū Desert. Nonetheless, wildlife flourishes where left undisturbed elsewhere on the volcano and is highly endemic thanks to Kīlauea's (and the island of Hawaiʻi's) isolation from the nearest landmass. 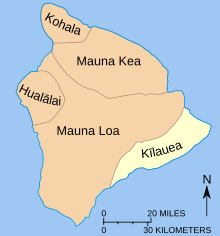 Historically, the five volcanoes on the island were considered sacred by the Hawaiian people, and in Hawaiian mythology Kīlauea's Halemaʻumaʻu Crater served as the body and home of Pele, goddess of fire, lightning, wind, and volcanoes. William Ellis, a missionary from England, gave the first modern account of Kīlauea and spent two weeks traveling along the volcano; since its foundation by Thomas Jaggar in 1912, the Hawaiian Volcano Observatory, located on the rim of Kīlauea caldera, has served as the principal investigative and scientific body on the volcano and the island in general. In 1916, a bill forming the Hawaii Volcanoes National Park was signed into law by President Woodrow Wilson; since then, the park has become a World Heritage Site and a major tourist destination, attracting roughly 2.6 million people annually. 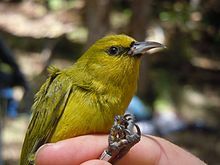 The 'amakihi ( Chlorodrepanis virens) is one of the many birds that live on the volcano's flanks. ^ Miklius, Asta; Cervelli, Peter (2003). 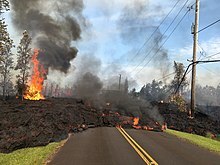 "Vulcanology: Interaction between Kilauea and Mauna Loa". Nature. 421 (6920): 229. Bibcode: 2003Natur.421..229M. doi: 10.1038/421229a. ^ a b D. G. Myer; D. Sandwell; B. Brooks; J. Foster; M. Shimada (2008). "Inflation along Kilauea's Southwest Rift Zone in 2006" (PDF). Journal of Volcanology and Geothermal Research. 177 (2): 418–24. Bibcode: 2008JVGR..177..418M. doi: 10.1016/j.jvolgeores.2008.06.006. ^ a b D. A. Swanson; J. Rausch (2008). "Human Footprints in Relation to the 1790 Eruption of Kīlauea". Eos, Transactions, American Geophysical Union. American Geophysical Union. 89 (53): 2022. Bibcode: 2008AGUFM.V11B2022S. ^ Ann K. Sakai; Warren L. Wagner; Loyal A. Mehrhoff (2002). 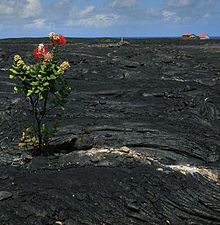 "Patterns of Endangerment in the Hawaiian Flora" (PDF). Systematic Biology. Oxford University Press. 51 (2): 276–302. doi: 10.1080/10635150252899770. PMID 12028733. ^ H. L. Carson; J. P. Lockwood; E. M. Craddock (1990). "Extinction and recolonization of local populations on a growing shield volcano". Proceedings of the National Academy of Sciences of the United States of America. United States National Academy of Sciences. 87 (18): 7055–57. Bibcode: 1990PNAS...87.7055C. doi: 10.1073/pnas.87.18.7055. PMC 54681. PMID 11607102. ^ Robert A. Craddock; Matthew Golombek; Alan D. Howard (2000). "Analyses of Rock Size-Frequency Distributions and Morphometry of Modified Hawaiian Lava Flows: Implications for Future Martian Landing Sites" (PDF). 31st Annual Lunar and Planetary Science Conference. Lunar and Planetary Institute. 31: 1649. Bibcode: 2000LPI....31.1649C. Retrieved 29 August 2012. ^ Athens, Stephen; Tuggle, H. David; Ward, Jerome V.; Welch, David J. (2002). 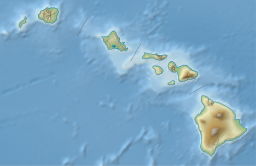 "Avifaunal Extinctions, Vegetation Change and Polynesian Impacts in Prehistoric Hawai'i". Archaeology in Oceania. 37 (2): 57–78. doi: 10.1002/j.1834-4453.2002.tb00507.x. Retrieved 4 September 2012. ^ Edwin Bernbaum (November 2006). "Sacred Mountains: Themes and Teachings". Mountain Research and Development. International Mountain Society. 26 (4): 304–09. doi: 10.1659/0276-4741(2006)26[304:SMTAT]2.0.CO;2. ^ E. A. Kay (1997). "Missionary Contributions to Hawaiian Natural History: What Darwin Didn't Know". Hawaiian Journal of History. Hawaiian Historical Society, Honolulu. 31: 27–51. hdl: 10524/170. ^ James D. Dana (1929). 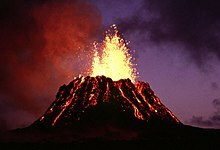 "Classics of Science: Dana Describes Kilauea". The Science News-Letter. Society for Science and the Public. 15 (426): 359–60. doi: 10.2307/3905498. JSTOR 3905498. ^ John Dvorak (May 2011). "The origin of the Hawaiian Volcano Observatory". Physics Today – American Institute of Physics. Archived from the original on 23 February 2013. Retrieved 4 September 2012. MacQueen, P (2011). "Forward modeling to access and improve gravity network geometry at Kilauea Volcano, Hawai'i". Oregon Undergraduate Research Journal. 1 (1): 24–44. doi: 10.5399/uo/ourj.1.1.1551.